At 9:45 AM, IST, the domestic unit was trading at 68.61/$. The Indian rupee gained 26 paise to trade at day’s high level of 68.57 against the dollar on Friday. The domestic unit opened 23 paise up at 68.60/$ compared to its previous close of 68.83/$. On Wednesday, the currency closed 13 paise higher at 68.83/$. On Thursday, financial markets in India were shut on account of Holi festival. The appreciation could be attributed to the sharp gain in the domestic market and a weak American currency against its major peers. Equity benchmark indices were trading on a green note on Friday with the Sensex gaining 131 points at 38,517 levels. The Nifty rose 36 points at 11,557 levels. The rally in equity markets led to strong foreign inflows (FIIs), which supported upward movement in the currency. On Wednesday’s trading session, FIIs bought Rs1,772cr worth of stock in cash. In the derivative market, FIIs bought Rs51cr of Index futures and bought Rs2,804cr worth of Index options. 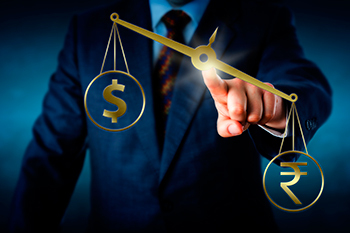 Further, a weakness in the greenback post dovish comments from the US Federal Reserve’s policymakers also helped rupee to hold its gain on Friday. In its two-day policy meeting the Fed kept its rates unchanged as was widely expected and indicated that not more rate hikes on the card for 2019. The US central bank dimmed its economic outlook and said it did not expect to raise interest rates this year. The policy decision makers now foresee the US economy to expand by 2.1% in 2019, compared with the previous forecast of 2.3% growth. In its second meeting of the year, the Federal Open Market Committee (FOMC) said "growth of economic activity has slowed from its solid rate in the fourth quarter," as household and business spending is expected to drop off and annual inflation has declined.